Meerut: PL Sharma District Hospital got its first CB-NAAT (Cartridge Based Nucleic Acid Amplification Test) machine for testing Multi Drug Resistant (MDR) tuberculosis on World Tuberculosis Day; the districts first too. All earlier cases were being sent to Agra for diagnosis which took a month coming as against the present scenario, where the result would be available to the patient within two hours. 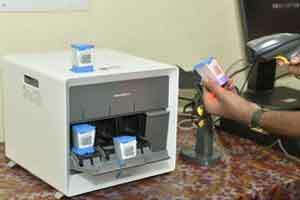 38 new districts were given this machine on the World TB Day; earlier only six districts owned it. Cabinet Minister, Shahid Manzoor, flagged off a van meant for tuberculosis awareness From the district tuberculosis office.